Kiddimoto are probably most well known for their exciting and innovative wooden balance bikes, including the ever popular Kiddimoto Kurve bike which comes in a range of funky designs. A new addition to the Kiddimoto stable is the Kiddimoto Super Junior Balance Bike which is also available in an upgraded ‘Max’ version. 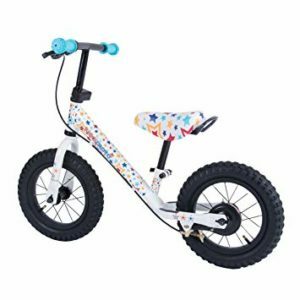 These bikes are very different from the Kiddimoto Kurve and other bikes in the Kiddimoto range, as they are metal balance bikes and aimed firmly at the younger age range of children in the balance bike market. The Kiddimoto Super Junior Balance bike looks great with a modern and stylish design, and is packed with an impressive number of features given that the bike is generally available at a mid-range price of around £60. The starting saddle height of 34cm means that this bike is most suitable for 3 year olds as it would most likely be a bit too big for most 2 year olds. 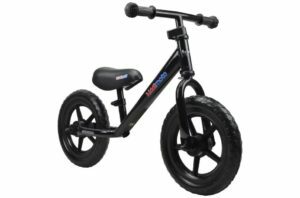 We have full guides to the best balance bikes for 2 year olds and 3 year olds elsewhere on this website. The seat has a large range of heights, and can be extended right up to 45cm which means that if you invest in this bike for your child they will have plenty of time to learn the principles of balance and steering before moving on to a pedal bike. As well as offering such a large range of seat heights, the seat on the Kiddimoto Super Junior is well padded, the frame is manufactured from lightweight steel and the bike is equipped with comfortable sculpted hand grips with padded ends from protection during falls. The tyres on this bike have recently been upgraded to pneumatic rubber tyres which provide excellent grip as well as enhancing the appearance making it look like a proper like bike. It is also lightweight at 3.3kg which makes it easy to carry when your child gets tired. The Kiddimoto Super Junior Balance bike makes a great choice when you are looking for the best balance bike for your child. The Kiddimoto Super Junior Balance bike is a great starter bike, but if you are sold on the look and design of the bike then it may well be worth upgrading to the ‘Max’ version of the bike. This model offers several additional features, the most notable of which are the additional of a drum brake for the front wheel and an extra grippy footplate. It is also available in several of Kiddimoto’s trademark designs including Skullz and Pastel Dotty (pictured). These features give the Max version of the Kiddimoto Super Junior Balance bike a superior performance, as the brake will save on shoe leather and the extra grips on the footplate is a cute little addition that is often overlooked on other bikes. The bike also includes a carry handle and pneumatic air tyres for grip on any terrain. These extra features increase the weight of the Max version to 4.7kg, so this bike would be suitable for older children aged 3 and above who would be capable of handling a bike of this weight. You would also expect to pay around £20 extra.